Hatchling anoles lizards explore a tank in a Harvard lab where researchers are studying what role environment plays in speciation, or the process by which new species arise. In a Harvard University basement, a massive colony of lizards thrives. For the past two years, more than 1,000 anole lizards from six Caribbean islands have populated rows of tall, narrow, and extremely humid tanks on campus. These are the descendants of 500 lizards that researchers caught and transported from their island paradises to Cambridge, where scientists are searching for a better understanding of speciation — that is, the process by which new species arise. Scientists know that the little brown reptiles have adapted to varying habitats, from Cuba to the Cayman Islands. The lab is testing a theory discussed in recent years that postulates such adaptation to new environments drives the process of speciation. Instead of a gradual evolution over millions of years, adjusting to a new environment could play a key role in making a new species come about more rapidly. Geneva said the anoles are ideal for the research, which began in 2016, because they are remarkably diverse. There are more than 400 species in the Caribbean, South America, and the southern part of the United States. Their characteristics often vary depending on where they’re found. They may differ in body size, head size, and toepads, which let them hold surfaces without effort, similar to geckos. Anoles are quite small. They range from 6 to 12 centimeters and look like baby iguanas. Regardless of the weather outside, it’s 85 degrees inside the basement year-round. The lights are controlled so the “sun” rises and sets at the same time every day. 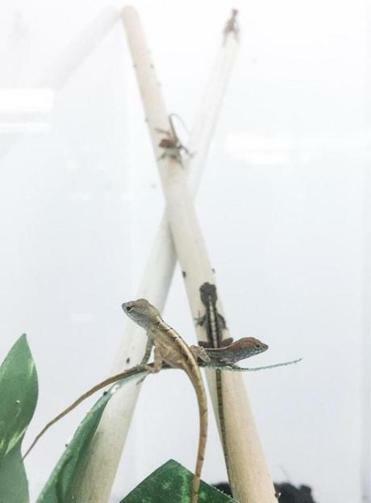 Two or three full-time staffers care for the lizards every day in the lab, which, at 900 square feet, is among the largest facilities of its kind. It is not open to the public. He should know. Geneva oversaw the lab’s design and construction after arriving at Harvard in September 2015 from the University of Rochester. He was also one of a handful of people who traveled to the islands to catch the lizards in their natural habitats. After doing a similar, though smaller, project at Rochester — pairing two different sub-species of lizards from two different environments, Geneva has become something of an expert on catching the little reptiles. The Harvard lab is one of the top customers of a Georgia-based cricket supplier called Ghann’s Crickets in Augusta, ordering around 80,000 crickets a week. The adult lizards eat three times a week, while the much smaller hatchlings are fed tiny pinhead crickets every day. Every other week, at least seven people take on the five- or six-hour task of checking for lizard eggs. Geneva said anoles lay a single egg every one to two weeks. Scientists sort through a mineral called vermiculite, placed in cups inside the bottom of the tanks, to find the eggs. As the hatchlings grow, researchers record data on the offspring produced by different lizard pairings. The populations differ in their behaviors. For example, there’s one group from the island of Cayman Brac that will always try to jump out of the tank. Cristela Guerra can be reached at cristela.guerra@globe.com. Follow her onTwitter @CristelaGuerra.